I am John Buckwalter and like many baby boomers born in the 40's I took an early interest in trains. My parents made a nightly drive to the Powell crossing to watch the Pennsylvania evening passenger train. 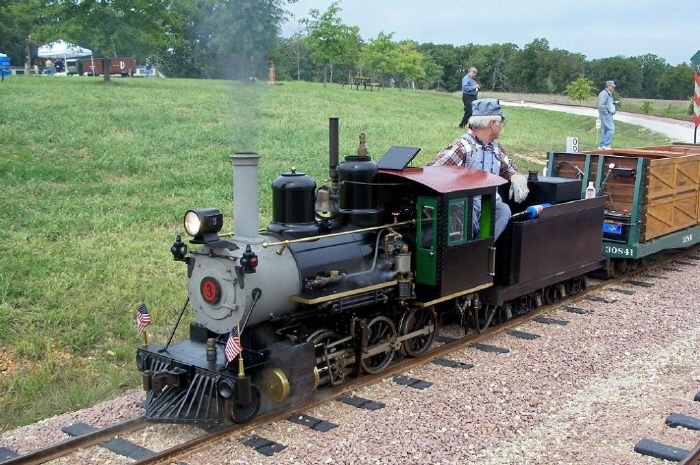 Since then I have lived with the train bug through Lionel, HO gauge trains, 15" gauge trains and even owned a full size Tourist Railroad before making the switch to 7 1/2" ga.
My first live steam construction project was a 15" ga. Mogul. To build this engine it was first necessary to make the needed design drawings with the aid of CAD. Once the drawings were completed the next phase would be to make patterns from which castings could be made. With the castings in hand construction began and 8 years later here is the result. The Shay project like the Mogul started with the design phase. Plans from Three other Shays were studied for ideas. The basis for the designs of the 20 Ton Shay were the drawings published in "Narrow Gauge & Short Line Gazette" for a 24 Ton Wood Burning Shay. Research did not find any 24 Ton Class A Shays built by Lima and based on wheel base the Gazette drawings were more likely a 20 Ton engine. The 2 1/2" scale Harris Shay plans were based on the Mich-Cal 13 Ton Shay and supplied the most information for this larger version. A Shay research trip to the mid-west added lots of detail information to the final project.